Joseph Turner, 1775-1851, one of England’s famous artists in art history painted one of his famous paintings "Falls of the Rhine at Scahaffhausen", in 1806.It is a picture of grandeur and the art sublime. The majestic rushing waterpower dwarfs the tiny insignificant figures walking along the waters edge. Emotion and romantic effect is heightened even more viewing the rough gigantic rocks, and the towering, foreboding untamed wildness on the edge. The famous art painting "Dido Building, Carthage", painted in 1815, shows Joseph Turner’s increasing interest in atmospheric effects. The light of the sun becomes an enveloping dynamic, surrounding and fusing all things together beyond the immediate view of the buildings. The serene quality of the foreground plane in the "Dido Building", is replaced in his art "Ulysses Deriding Polyphemus", 1829, by a more inclusive, all encompassing white heat of atmospheric art effect. Light is becoming an element for Turner. It expresses the invisible power and dynamic force of nature. This is different from the Impressionist use of light where light is used as was a method to express form in nature. By 1835, the atmospheric art effects became an all consuming entity to Turner in the famous painting "Burning of the Houses of Parliament".Fire not only raged within the buildings, but united and burned with the water and the sky to become a massive power beyond the comprehension of mere mortals. Joseph Turner’s landscape art paintings were often linked with literary themes or actual contemporary events. "The Slave Ship", painted in1840, was an incident he had read about in a newspaper where the captain of a ship had thrown slaves overboard when and epidemic broke. The captain tried to insure himself against perceived losses due to disease for which he was not insured, over against loss due to natural causes (drowning) which he was insured against. Linear boundaries are non-existent in Turner’s art "Steamer in a Snowstorm", painted in 1842. Color becomes an expressive, energetic entity rather than descriptive entity. In this painting, another of Joseph Turner's famous paintings, Turner becomes an abstract expressionist in art history. This is quite different from his origin as a romantic realist. Other famous painters of Romanticism are Eugene Delacroix and Theodore Gericault. 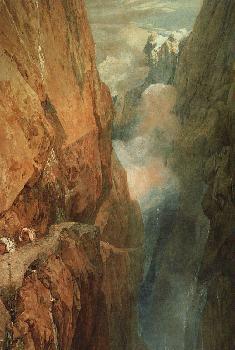 To view the entire gallery of Joseph Turner paintings, click here.